Self-discovery is a fundamental component of personal growth. We must take the time to discovery who we are as a person. This is accomplished through self-reflection. Self-reflection allows us to think about and examine our actions, preferences, feeling, values, beliefs, emotions, and tendencies. Since we are all different in the way we think, feel, act, learn, and perceive the world, it is beneficial to take the time to reflect in order to gain a better insight into ourselves. The first step in the self-discovery process is self-reflection. You must make the time to stop and really think about who you are. Quiet meditation and reflection will allow you to refocus your mind and concentrate on your inner self, and allow you to examine the way you “see” yourself. 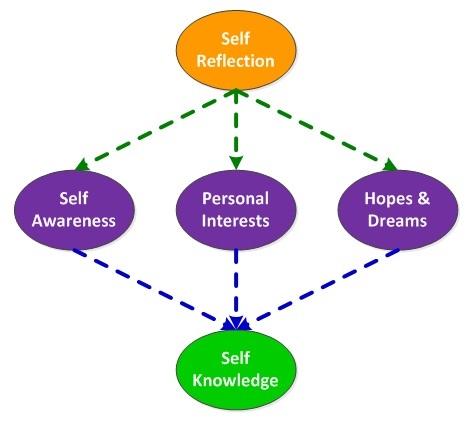 Self-Reflection allows you to explore your individual personality, natural preferences, values, beliefs, preferred styles and tendencies in order to become self-aware. You can also reflect on your personal interests, your dreams, and what you would like to do for a living. Our process of self-discovery is divided into four segments. Self Awareness is having an insightful understanding of our personality, values, tendencies, and beliefs. It is the process of analyzing our thoughts, beliefs, tendencies, and emotions to help us to determine our values and principles. Acting on this knowledge allows us to reach our fullest potential and to become fulfilled and self-actualized. Unlike many of the elements of self awareness, where you explore traits and tendencies that remain mostly constant throughout your life, your interests often change as you grow and experience life. It is important to identify what interests you because by knowing what you enjoy you can do more of those activities. The more activities you do that bring you joy and happiness, the better you feel about your self and your life. As your interests are in the here and the now, your hopes and dreams are for your future. Your hopes and dreams are wishes or aspiration for your future. They are thoughts and mental images of your futures that conger up positive emotions. A successful and fulfilled life is often measured by the ability to pursue one’s own dreams. Career discovery is the process by which a person identifies his or her ideal career which he or she will find fulfilling and rewarding. To find a career that will be both challenging and gratifying, you need to take time and reflect to learn about yourself. What motivates and interests you? What do you find fulfilling? What skills, knowledge and abilities do you posses? What kind of work setting fits best with your personality type? Self awareness leads to the accumulation of self-knowledge. Self-knowledge identifies what we know about ourselves. It is with self-knowledge we can understand our principles, values, and our purpose and are able to apply it to our lives. With self-knowledge we can understand our strengths to build upon, as well as identify areas where we would like to make improvements. We do not typically change our personalities, our values, or our needs based on what we learn about ourselves. However, an understanding of our personalities and characteristics can help guide us towards situations and experiences in which we will flourish, and help us avoid those circumstances in which we will experience stress or anxiety. Self-knowledge is essential for making decision about our life and which road to travel down. Because ultimately, it where we focus our attention that will determine where you go in life.